Adweek's Brian Morrissey has a nice take and conversation around the topic. Yes, it was originally advertising agency Modernista! that threw away their Website in favor of simply patching together all of their information across various social networks and services. Nearly a year later, Skittles has done the same thing. If you point your Web browser to Skittles.com, you will not be greeted by the familiar sight of a highly "experiential" or branded site complete with games and promotions—instead, you will go to a Twitter search result page that shows you what people are saying about the brand in real time. The "siteless website" then places a "widget" above the Twitter search result and lets you navigate to other destinations, mostly distributed across the Web, from product pages on Facebook, to video channels on You Tube, to simple product information on Wikipedia and don't forget photos on Flickr. Another reason this is worth watching closely is because we're seeing a social media reality play out in real time. While you can listen in on, respond to and potentially even influence conversations—you cannot control them. Currently, pointing your browser to Skittles.com will also result in some profanity showing up (via Twitter). Note: Skittles does have age verification in place, as mentioned earlier but you can see the updates behind it. Whether you love it, hate it or think it's a gimmick—right now this tactic is providing a valuable insight into the business world and current marketing challenges. Brands are scrambling to become more relevant in our lives. Traditional Websites aren't enough. Banner ads aren't enough. 30 second spots can be ignored and brands are desperately looking for new ways to interject themselves into our conversations. We will see more of this, not less. In somewhat related news, Forrester released a new study today titled "Add Sponsored Conversations To Your Toolbox". Now watch the language here very closely. "Sponsored Conversations". 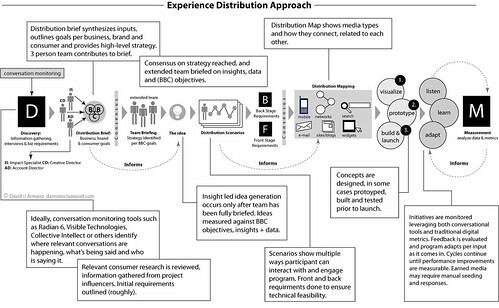 This is an attempt to frame an emerging media model which we will also be seeing more of. Getting people to distribute your content by brokering paid arrangements with agencies or the distributors themselves. The "distributors" can be bloggers, influencers etc. who are empowered to say whatever they want about your brand. I cover this example under my "paid and earned" media model on the paid side, since bloggers do get paid. But it's an emerging model and the focus is on distribution etc. Again, this is a response to the media fragmentation and poor search engine results many brands are experiencing. Increased chatter about brands can help resolve some of these issues (and positive chatter is ideal). Now comes the hard part. It's difficult enough for brands, organizations and their partners figuring out all of these new models—on top of that, it will not be enough in the long term to merely tap the social channels or point your URL to what's being said about you. 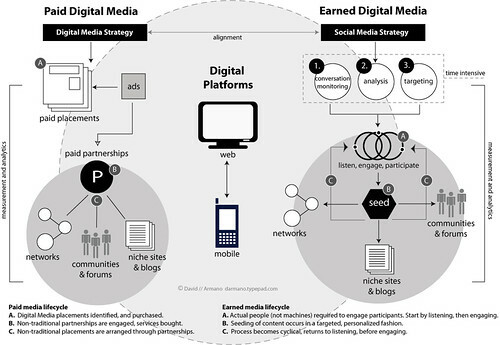 If you take a look at the right side of "earned media", brands will have to begin their initiatives my leveraging both listening tools (Radian 6, etc.) and qualitative insights, and evolve the existing creative process to something more informed, adaptable and responsive. This is something that I've been working on in it's early stages (below). So in reality, the story is bigger than what Skittles or Modernista! have done and the punditry that will inevitably swirl around it. The big takeaway is that the traditional (yes, this includes digital) model is being distrupted before our eyes. Business as usual in interactive marketing used to mean a Flash and promo heavy website for a brand like skittles, and now it looks entirely different. And it doesn't mean it will work either. Do people really want to engage with a brand like this on Facebook, a ecosystem built primarily for managing your social and professional life? We're getting closer to finding out. So what do you think?